Have you heard? You can trade frustration for peace of mind. Join customers who have held these in their hands and have immediately fell in love with their practicality and beauty. Our reliable, heavy duty and US made clothespins always outlast and outperform other pins on the market. With a lifetime guarantee you can purchase with confidence. Each pin is made in the Pacific Northwest with local maple and a heavy duty stainless steel spring. This winning combination produces a pin that can be handed down through generations. 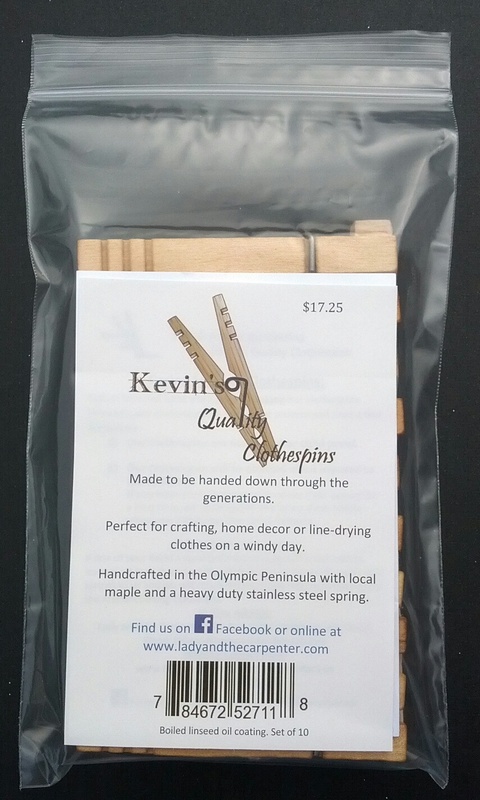 At 3.5” long and 7/16 wide Kevin’s Quality Clothespins are longer, wider and easy to hold. One pin holds a pair of wet jeans on a windy day. Linseed oil helps to protect the clothespins from the weather and brings out the beautiful wood grain. The linseed oil soaks into the clothespins and will not harm clothing. Note: This is a handcrafted product and not every clothespin will be exactly like the others. If one of your Kevin’s Quality Clothespin should break due to normal wear or manufacturing defect, return the parts (wood and spring) to us and we will return to you a new clothespin to replace the malfunctioning clothespin.